This deliciously light and creamy dessert is so simple to make, try with a mix of sharp fresh summer berries or on its own sprinkled with hazelnuts. Place the rhubarb and sugar into a small saucepan over a medium heat, and squeeze over the juice of half an orange. Cook for 4 – 5 minutes until the sugar has dissolved, then tilting the pan on its side, add the liqueur and set it alight. When the flame has distinguished remove the pan from the heat and divide the rhubarb mixture between six fancy stemmed glasses (i.e. martini glasses or champagne flutes). Put the cream and sugar and vanilla into a pot and bring slowly to the boil. Soak the leaves of gelatine in cold water ensuring that they are fully immersed. Strain the gelatine with a fine sieve to remove any excess moisture. Take the cream off the heat and whisk in the gelatine. Whisk continuously to make sure that the gelatine has broken down fully and incorporated into the mixture. Allow the mixture to chill slightly before pouring it over fruit. 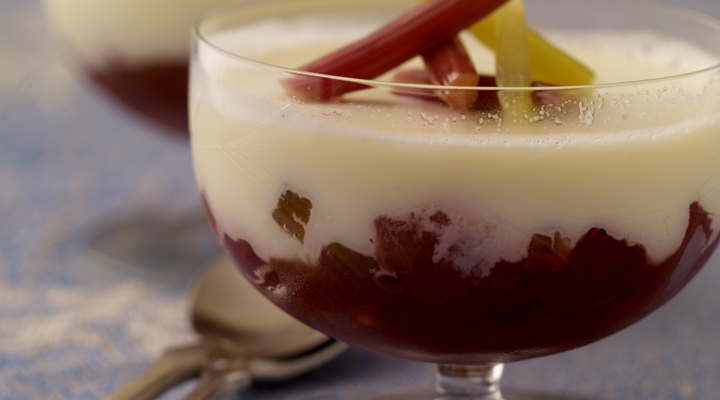 Divide the mixture between the glasses (no need to fill them up fully as the mixture can be quite heavy), when pouring over the fruit, pour the unset Pannacotta over the back of a teaspoon to ensure the rhubarb compote is not disturbed in the glass. Transfer to the fridge to set for 5-6 hours or overnight.